For those who’d rather spend their time drinking great coffee than learning how to be a barista. The Krups EA815050 Essential Automatic Espresso Machine ($700) isn’t all that smart. It doesn’t power up and brew a cup of mud when the sun rises or send you a text message after filling your cup. Heck, it doesn’t even connect to your home Wi-Fi network. But it almost completely automates the production of flavorful espresso, cappuccino, and yes, plain ol’ joe. 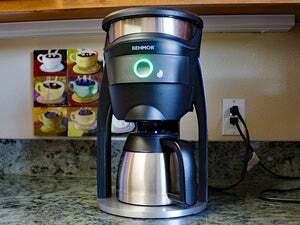 This is a thermoblock-based “bean-to-cup” machine, which means it heats water on the fly and grinds only the coffee beans that are needed for each cup right before each cup is brewed. Coffee brewed from freshly ground beans tastes better because the essential oils in the coffee beans don’t have time to evaporate as they do with pre-ground beans. Push the EA815050’s start button and it will heat the needed amount of water, spin up its burr grinder, and pull down a measure of beans from its top-loading hopper. Well, “pull” is giving it too much credit. The grinder relies on the weight of the beans and gravity, which gives rise to my number-one criticism of the machine. Krups recommends using only medium-roast beans, because dark-roast beans tend to be more oily. Well, I tried medium roast and wasn’t satisfied with the flavor the machine extracted from the beans. When I went back to my favorite French roast, I quickly discovered that the oil does indeed cause the beans to stick together, preventing some of them from falling from the hopper into the grinder. Krups’ user’s manual suggests that if you must use dark-roast beans, you should stir the beans prior to brewing in order to separate them as the grinder operates. 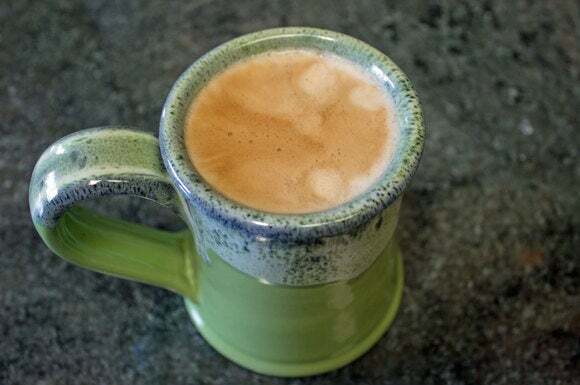 The EA815050 produced a nice and thick crema when it prepared this cup of coffee (a double-cycle of 4.3-ounces brews). A large cover over the mouth of the grinder is probably there to prevent foreign objects—or fingers—from coming into contact with the grinder, but I found that I had to not just stir the beans, but repeatedly thrust a spoon into the hopper during the grind cycle to force enough beans to fall in (even with Krups’ “oily bean accessory” in place). The throat of the grinder is sufficiently long that the spoon never made contact with its burrs, but I imagine it would void the warranty if it ever did. You can set the grinder to produce fine, medium, or coarse grounds. Once the beans are ground, they’re tamped into a compact puck and injected with pressurized hot water (the EA815050’s water pump produces 15 bars of atmospheric pressure) to extract your hot beverage. After the coffee is dispensed, the used grounds are automatically dumped and the machine is ready for another serving. It’s a completely automatic process—apart from that whole stab-at-the-beans-with-a-spoon thing. The only other intervention that’s required is to periodically refill the water tank, refill the bean hopper (it holds up to 8.8 ounces of beans), clean the coffee drawer, and empty the used-grounds collector and drip tray. The water tank, which holds 57 ounces of water, is removable and has a lid that swings up to present a built-in handle. It’s an excellent design—just don’t overfill it or water might slop over the sides while you’re toting it from your water source back to the machine. 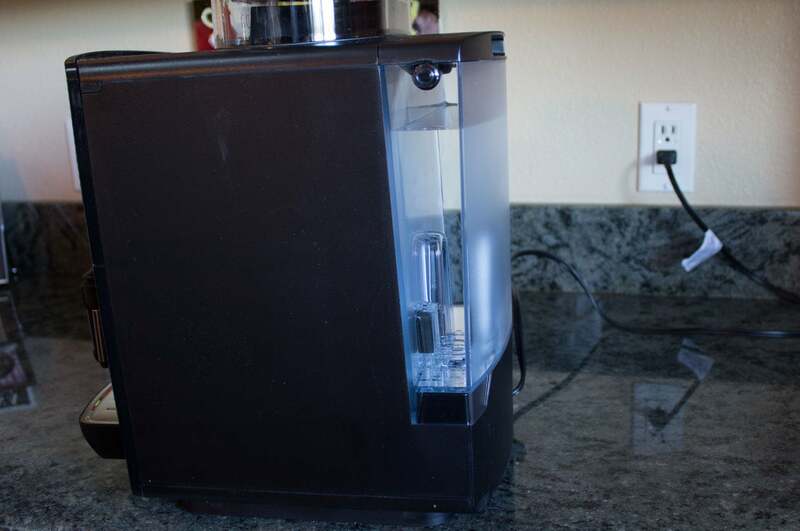 It can also be fitted with an optional water filter that Krups did not send along with the review unit. I used filtered water from my refrigerator for my test brews. The bubbles in the milk froth are larger than ideal, but my technique might be more to blame than the espresso maker (and yes,I spooned—versus poured—the froth over the coffee). The EA815050 is capable of brewing three types of coffee in varied serving sizes: Ristretto (0.7 to 1.0 ounces), espresso (1.0 to 2.3 ounces), or coffee (2.7 to 6.0 ounces). The machine can also execute two brew cycles in a row (grinding a fresh set of beans for each cycle) to either double those serving sizes for a single cup, or to brew two servings in separate cups. The height-adjustable coffee outlets are close enough to pour into one cup or into two placed close together. I said at the outset that the EA815050 isn’t all that smart, but it does have enough brains to greatly simplify the coffee-making process. It can memorize two of your favorite brew settings (the quantity, strength, and the number of cycles), and it has a monochrome LCD that works in conjunction with a number of buttons on its front panel. The display shows numbers and somewhat inscrutable icons to inform you of settings and periodic maintenance requirements (you’ll want to keep the manual handy to decipher the hieroglyphics). The machine will inform you when its water tank needs to be filled, its coffee drawer and grounds collector need to be emptied, when it needs a cleaning cycle (a 13-minute process), and when it needs to be descaled (a 20-minute process using a descaling powder). Plastic floats in the drip tray pop up when that gets full, but I got into the habit of dumping the tray each time I disposed of the used grounds. You’ll want to leave some space behind the machine so you can access the water tank without needing to rotate the whole thing to take it on and off for refills. You can inform the machine of your water’s dissolved mineral content (Krups provides a test strip that measures water hardness on a scale of 1 to 4), adjust the temperature at which you prefer your coffee to three different settings, adjust the strength of your coffee (also on a scale of 1 to 3), and enable or disable an automatic rinse cycle when the machine is powered up (you can also perform the rinse cycle manually at any time). A steam wand on the right-hand side of the appliance enables you to produce steamed milk and milk froth for a cappuccino, latte, macchiato, or similar beverage. The EA815050 will produce steam for a maximum of two minutes, or you can shut down the function manually when you have enough. The wand will swing out and away from the espresso maker to a degree, but I found it awkward to maneuver the milk pitcher around the drip tray. I had to tip my 4.5-inch-tall pitcher to dip the wand into the milk, and invariably spilled some of the froth when I tipped it out again. On the bright side, the wand produced copious amounts of froth and raised the temperature of the milk to about 170 degrees. The wand is also easy to remove and clean. 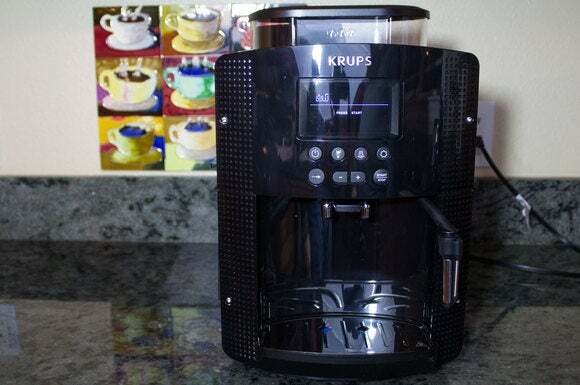 The Krups EA815050 is ready to brew 41 seconds after you push the power button, and it will finish dispensing a 4.3-ounce cup of coffee 48 seconds later (I chose that serving size as it’s near the midrange of what the machine can produce). 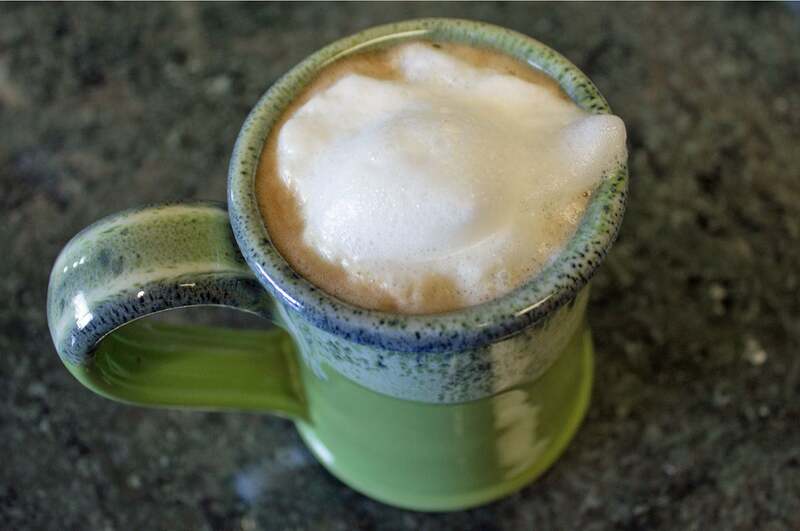 If you wish to froth milk to prepare a cappuccino, you’ll need to wait an additional 27 seconds before the steam wand is primed for use. I’d also recommend pre-warming your cup with hot water ahead of the brew cycle, because the coffee the Krups dispensed into my pre-warmed cup came out at only 172 degrees Fahrenheit—and that was with the appliance set to the highest of its three temperate settings. According to the National Coffee Association, the ideal water temperature for brewing coffee is between 195 and 205 degrees. Although the coffee doesn’t stay piping hot for long, the machine does produce a rich and aromatic brew with a thick layer of crema, even in larger quantities and after back-to-back brewings. And the coffee is truly good to the last drop, with no grounds or sediment ever making its way into the cup. The EA815050 is made for those of us who’d rather drink great coffee than meticulously fuss over the details of its preparation. A tweak of its bean hopper and grinder design would eliminate its biggest shortcoming, and I wish that it heated the water by another 10 or 20 degrees or so. But during my month-long evaluation, I’ve grown accustomed to poking a spoon in the hopper while the beans grind. And I haven’t been able to discipline myself to pre-warm my cups, so I suppose that complaint is also relatively minor in the grand scheme of things. You don’t need barista skills to produce great-tasting caffeinated beverages with the Krups EA815050.